Nvidia are running a two-day conference in Montreal right now called ‘The Way It’s Meant to be Played’, best pronounced in the bassy boom of EA Sports’ ‘It’s in the Game’ chap. There’s been a lot of talk about shadow and fog rendering and shadow-in-fog rendering, but yesterday afternoon Warner Bros Montreal senior producer Ben Mattes took to the stage and said something really interesting: most Arkham players haven’t been very good at being Batman. Even after completing the last game, some of them twice, they still didn’t managed to embody the dark knight. But in building the game, Warner Bros Montreal have learned “just how few” people really understand how deep the series’ trademark free-flow combat system is, or how useful its predator and navigation systems can be. 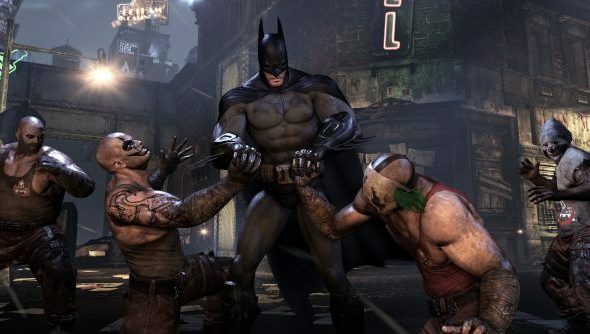 “They finished Arkham City, and then they maybe did it a second time, and then maybe even did some challenge maps, and they’re still just sort of scratching the surface,” said Mattes. “They’re not yet that black-belt in being Batman or the true dark knight we want them to be. As luck would have it, the young Batman of Arkham Origins has to grow from a beaten-down vigilante to the dark knight over the space of one very busy Christmas Eve. It’s a fictional tarpaulin provides the perfect opportunity for the player to do the same. To that end, WB Montreal have plonked a training gym in the Batcave. “You go back to the Batcave, you set up a training challenge to help you practice against a martial artist for example, or use a new gadget like the concussion detonator,” explained Mattes. You can watch the whole demo courtesy of PC Performance from about the two-hour mark. It’s almost certainly the most uninterrupted footage of the game we’ve seen to date, and makes it appear dead good. Do you consider yourself to be a competent Batman?